The F-35 Lightning II, the P-38 Lightning and the F-22 Raptor – which was originally named “Lightning” – are all fighters made by mega-defense contractor Lockheed. And being a mega–contractor, it has mega history. 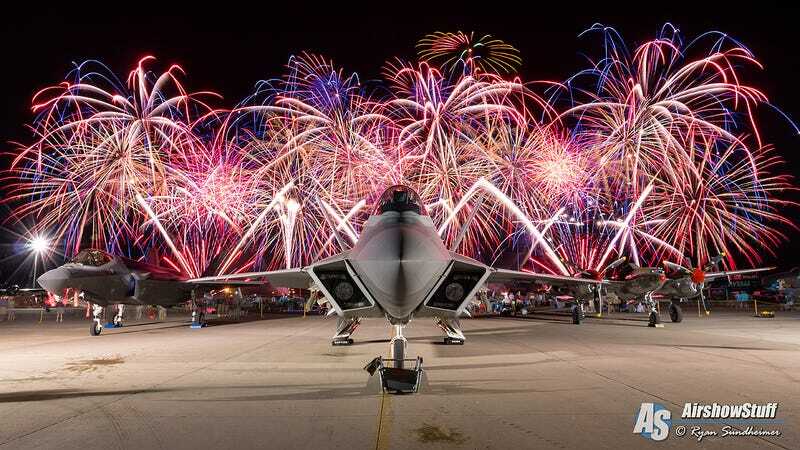 Here are those three planes showcased under a sky set ablaze with fireworks. Taken at this years Experimental Aircraft Association AirVenture air show in Oshkosh, Wisconsin, it’s the largest air show in the United States, with not just hundreds of thousands of people attending, but also thousands of aircraft of all different types flying in for the event. Flying displays, static aircraft displays and a whole slew of vendor booths and aerospace industry related groups all have a presence there. New product offerings are unveiled, seminars are given and generally there are just huge crowds. It’s also known to be one of the best opportunities in the world to capture amazing photos of airplanes, and in this case, Ryan Sundheimer from Airshowstuff.com was looking for an explosive backdrop, and boy did he get it. This year’s AirVenture extravaganza is a historic one for multiple reasons, two of which include the first ever attendance of a B-52 and the first time the F-35 has appeared at a non-military air show, with two of the jets flying in for the festivities. A huge thanks to Airshow Stuff for sharing these awesome images and video with us. Make sure to check them out on Facebook and Twitter too, they do great work covering air shows across the US and around the globe.